Let’s say you’ve got your dream client interested – you’ve piqued her interest. But she’s a little confused about what precisely she’s going to get out of working with you. She’s interested, but not 100% convinced yet (which means she’s not ready to give you her money yet either). Her fear of making a bad investment is starting to overtake her interest in working with you. She clicks away & hires someone else. Bummer. Because your dream client wasn’t sure she was going to get what she wanted out of the investment. She couldn’t picture how it would help her – which means she can’t imagine herself working with you. But what will I actually get? How will those coaching sessions help me? What will I be able to achieve as a result of doing this / hiring you? What are the benefits my customers receive from my product / service? Seems easy enough. The problem is that your answer needs to be meaningful. Seriously, everyone says that… which means that those responses become white noise that no one bothers to listen to anymore. They want to know what value you bring to the table & they want more precisely than “I help you save time.” They need to know what they’ll actually get from their investment. You want to stand out from the crowd, so we’re going to do a 2-part writing exercise today. 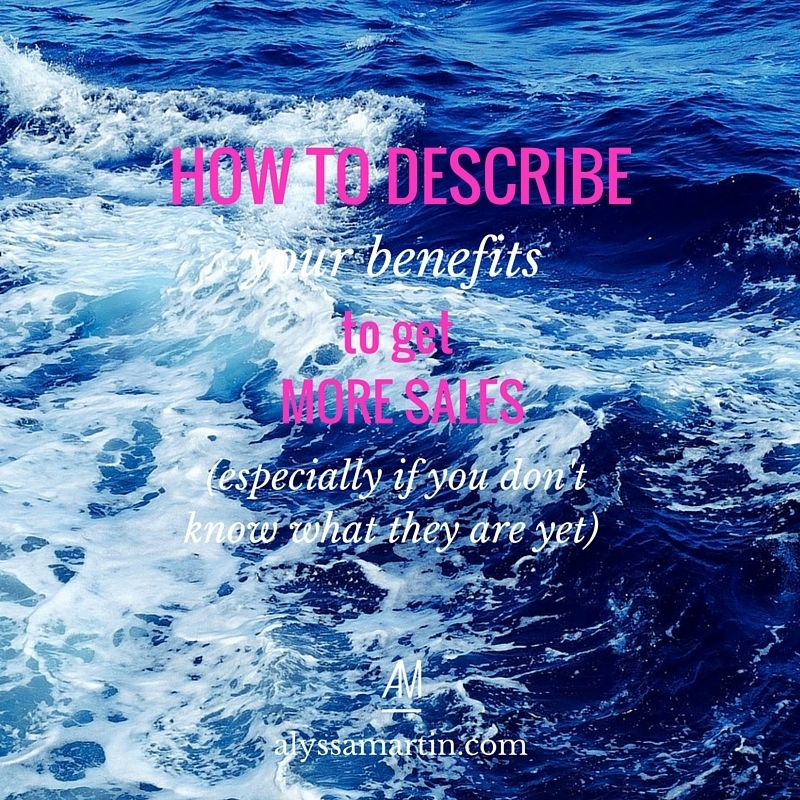 It’s designed to help you get laser focused on how your work changes your client’s lives or businesses for the better, so that you can start adding those benefits into your marketing. Get a pen & paper ready now. Imagine you wake up tomorrow and discover your service/product has been widely adopted by all of the people who need it in the whole world. The problem is, everyone who’s worked with you or bought your thing remains anonymous. The only way to know who they are is by looking for signs. What’s the first, tiny sign you’d see that would make you think, “AH! That person must be one of my customers!”? One thing that kills conversions is that your reader just can’t imagine herself as your customer. So you’re going to tell her a story. You’re going to paint a picture of what her life will be like AFTER she’s worked with you. Imagine this… / Picture this… / How would it feel if this was you? / Would you like this to be you? Then you’re going to describe what her life / business / hair / weight / wardrobe / relationships will be like after she has worked with you. She might gain confidence, ease, support. Or, she might lose fear, confusion, overwhelm, wasted time. Write down everything you can think of about what her life looks like after working with you? How has your work transformed her life for the better? Make the list as long as you can. Leave no stone left unturned because you usually have to wade through the vagueness to get to the ideas that are actually usable. Once you have your list, weave your biggest, best dot points together into a short narrative. Keep it to 3 paragraphs or less. It’s no coincidence that Angela’s client inquiries quadrupled, plus she increased newsletter subscribers by 10-15x. I’m not even one of her dream clients, but it still gives me chills to read her homepage. You can tell this story on your home page or your sales page(s) or your about page… just about anywhere. It’s that powerful. Give it a try. I promise you won’t be disappointed.